It is my honor to serve as Interim Vice Provost for Information and Technology and CIO for OSU. In this role I directly lead two great organizations that provide the essential foundation of Information and Technology that define a modern University experience for our students and 21st century capabilities for our faculty to teach and conduct research. 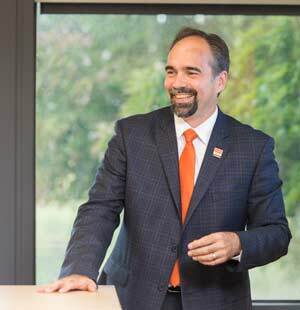 As CIO, I am also responsible for the entire IT practice at OSU and through my office I coordinate overall strategy, service coordination, and policy for IT services in support of OSU’s mission. Our state of the art teaching facilities in the Learning Innovation Center (LiNC), our top-performing Wifi network, and our nationally recognized Analytics and Reporting offerings are testament to the dedication of OSU’s IT staff to providing the tools and information that our students and faculty need to create healthy people, a healthy planet and a healthy economy through our aggressive research agenda, excellent educational programs, and community engagement. This website offers a gateway into all IT services at Oregon State and I invite you to explore it to learn more about the services we offer. The Office of Technology Strategy and Innovation manages and distributes student and instructional technology funding for university-wide and college-specific services and infrastructure, aligning its investments with university goals for student success. The Office of Technology Strategy and Innovation also facilitates strategic change and innovation in instructional practices and advising through a grant program and by promoting effective uses of Learning Analytics to support assessment of student learning and experience. The office advocates for the IT needs of campus researchers and encourages development of new campus-wide and multi-university solutions that improve researcher productivity and competitiveness. The Office of IT Relations fosters a collaborative IT community across OSU in support of the common vision for OSU's technology landscape. The office works to develop and sustain effective, professional relationships among all of OSU's IT groups, and actively promotes the shared vision and goals. The office also works to manage relationships between OSU IT providers and our partners and customers, helping to ensure that the entire OSU IT practice is connected to the needs of the university and well-coordinated in the delivery of services.